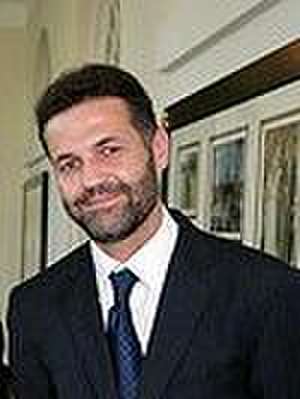 Khaled Hosseini (Persian: خالد حسینی‎ [ˈxɒled hoˈsejni]; ; born March 4, 1965) is an Afghan-American novelist and physician. After graduating from college, he worked as a doctor in California, a predicament that he likened to "an arranged marriage." He has published three novels, most notably his 2003 debut The Kite Runner, all of which are at least partially set in Afghanistan and feature an Afghan as the protagonist. Following the success of The Kite Runner he retired from medicine to write full-time. Hosseini was born in Kabul, Afghanistan. His father worked as a diplomat, and when Hosseini was 11 years old, the family moved to France; four years later, they applied for asylum in the United States, where he later became a citizen. Hosseini did not return to Afghanistan until 2001 at the age of 36, where he "felt like a tourist in [his] own country". In interviews about the experience, he admitted to sometimes feeling survivor's guilt for having been able to leave the country before the American invasion and subsequent wars. All three of his novels became bestsellers: The Kite Runner (2003) spent 101 weeks on The New York Times Best Seller list, four of them at number one. A Thousand Splendid Suns (2007) was a Times Best Seller for 103 weeks, 15 at number one. And the Mountains Echoed (2013) debuted near the top of the Times list and remained on it for 33 weeks until January 2014. De (autor) Khaled Hosseini et al. De (autor) Greg Mortenson et al. De (autor) Richard Wasowski et al.